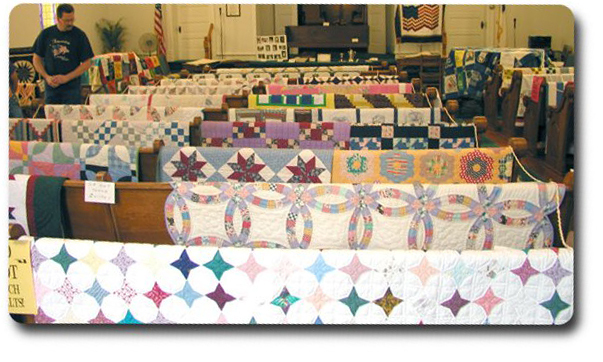 Quilt Show | Lincoln Days Celebration, Inc.
Show Open: Saturday, October 6 from 10 a.m.–4 p.m.
Show Open: Sunday, October 7 from 1–4 p.m.
Quilts on display in the sanctuary of Hodgenville Christian Church. We’ve added a Youth division for those ages 9 to 21 and a NEW CATEGORY for Woven Coverlet. Quilts are for display only, no monetary awards or prizes. All quilts will be carefully handled and protected. Attendants will be present at the display during all viewing times. Quilts may be removed from the display on Sunday, October 2, after 4:00 PM.